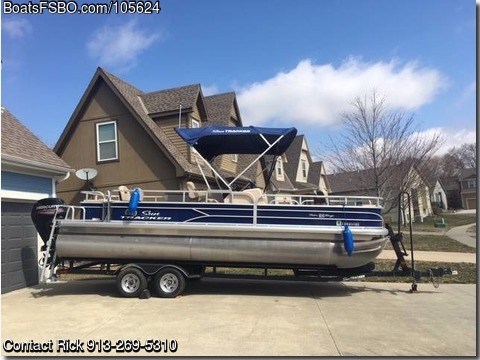 Contact the owner at 913-269-five three one zero...2017 SunTracker Fishing Barge 22ft powered by a 2017 Mercury 115ELPT CT 4S and set on a 2018 Trailstar TXXSP22PTAB2 trailer. Boat is in excellent condition. Also have SunTracker mooring cover and spare tire and bracket. Also added Lowrance Hook2 5 HDI fish/depth finder. Included,8 adult life jackets, 2 toddler life jackets, 2 ski belts, 4 bumpers, anchor and numerous ropes. Transferrable warranties, 8 years on boat and 5 years on motor.